I have a limited space in my bedroom as I've chosen to have a large closet to accommodate my things. That, plus a large bed and a small TV rack to hold a component, DVD players, speakers and a LED TV hung on the wall is enough to fill my room. I've already get rid of my mini dresser as I don't really find it functional. I already have a mirror attached to the wall which is enough for me to fix myself when dressing up. I didn't install any desk as I'm using my laptop on top of my bed using the laptop desk given to me by my daughter last Christmas. What I think that I need though is a bedside table to hold my drink whenever I'm watching TV in the room or to hold a book, a bottle of medicines or my eyeglasses. The problem is, I don't the luxury of space for this. I still have a space for that beside my bed but I don't want to use the floor space anymore. 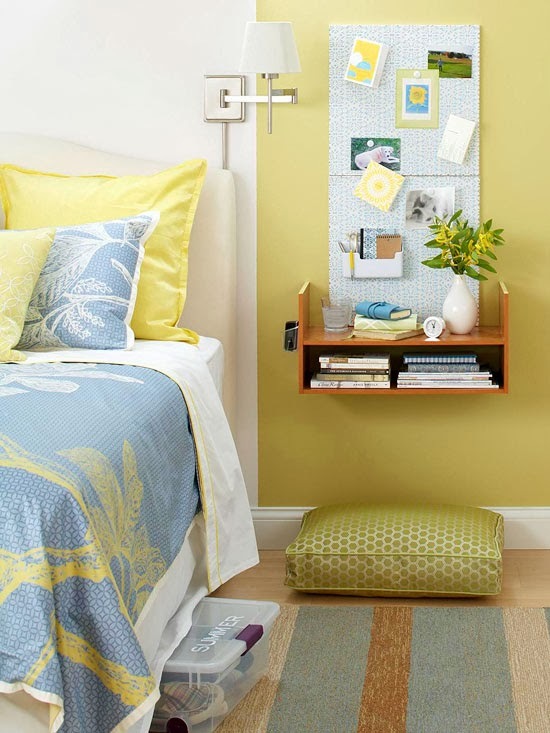 Looking at the photo above, I've finally found an idea, a hanging bedside table! But since, there's already a mirror attached to the wall where I intend to install the hanging bedside table, probably, I'm getting away with the magnetic board. I already have it on another place anyway. Also, I guess, I would have my bedside table foldable as I only intend to use it when required. So, I can flip it up and down whenever I want.